Posted on April 15, 2014 at 5:26 pm. 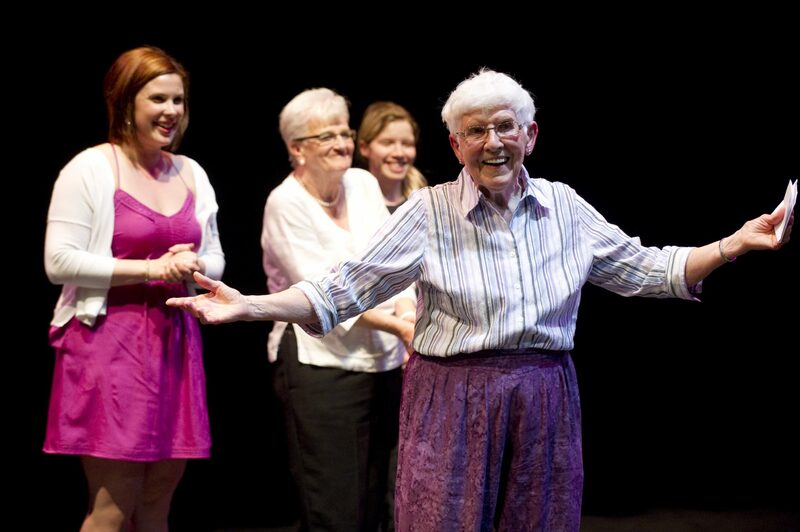 Editor’s Note: The GeriActors and Friends are also hosting Performance Storytelling Workshops! They are free, and will end with a final potluck celebration for family, friends, staff and GeriActors. All are welcome. Please email geriactors.friends@gmail.com for any further information. Becca had her first workshop this week, here are some insights from that experience. Mix oral history, storytelling and theatre all together and you get … Performance Storytelling! Using theatre games and exercises, various prompts, improvisation, laughter, and fun we inspire reminiscences and bring about different memories, both current and in the past. We then use those memories as entry points into creating short plays. Performance Storytelling is one of many techniques that GeriActors uses to create new works and has been a guide in play development since I joined the company as a “friend” in 2010. The beauty in using this technique is that, although you start out with one moment or memory from an individual, someone else is reminded of something similar and, through that, the moment grows. In exploring the moment further you may even find that disagreements and discussions come about and when this happens, a chorus sometimes forms. It is through these various connections that our plays and stories become universal. The stories are no longer connected to one person but instead become a truth for all. 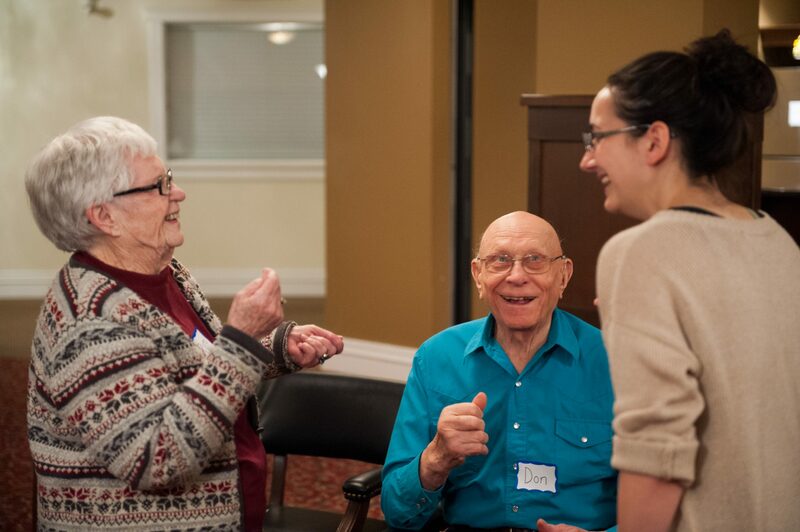 We decided to take Performance Storytelling workshops out into the seniors community as a way to introduce participants to the work of GeriActors, inspire similar groups and projects to form and thrive, and to advocate for seniors arts and creative aging. There are so many great stories out there and eager ears to listen and being able to honor people’s histories is a real privilege. Performance Storytelling is a great starting point to do this. Our workshops and residencies are open to anyone and everyone. No experience is necessary and all abilities are welcome. Whether you have a history in theatre, have always dreamt of performing, or just want to try something new these sessions are the perfect place to begin. 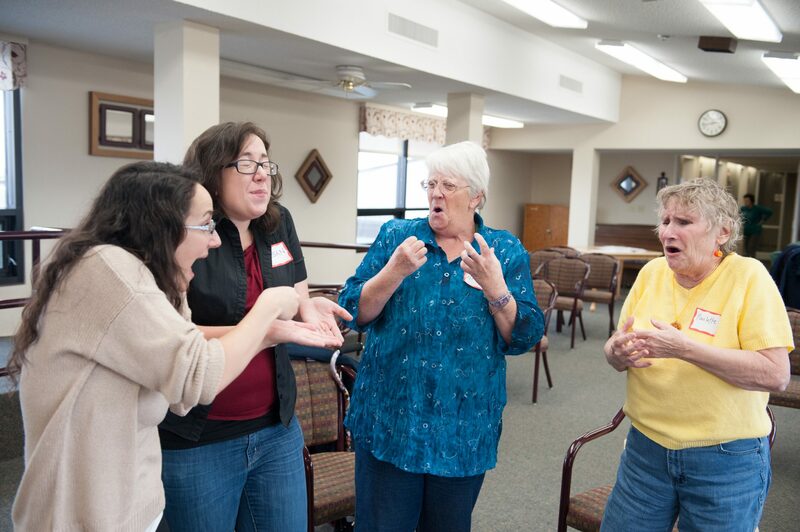 In a nutshell, these programs are all about: meeting new people, sharing your stories, listening to others, finding connections and commonalities, discussing, collaborating, being active and participating to your full extent, laughing, and having a lot of fun. The residency participants are a wonderful mixture of experiences, abilities, and histories. Some enjoy interacting with people and want to perform, while others just want to listen. One participant wanted to learn more about drama because her grandchildren perform. Another just wanted to try something new. It’s great to have such a mix of people coming together since it will, and has already, enriched the experience. What are some challenges/discoveries you’ve had facilitating these workshops? Walking into a new group is always a challenge. The first session is about gauging everyone’s comfort levels and interests and adapting quickly. Sometimes they’ll love the games and exercises and sometimes it’s all about telling stories. Both are wonderful but require different things. This group is a mixture so it’ll be a nice challenge to adapt plans to suit varying wants and needs. The next step is to continue discovering those stories and bring them to life. This group is full of stories and I am excited to hear what everyone has to share. Editor’s Note: The GeriActors and Friends are starting their performance tour today! Email Becca at geriactors.friends@gmail.com to book a performance. Today’s blog post is by Dhana Cartmell the director of Tjalling Zonderland and Something From Nothing, two plays on tour this season. I first met the GeriActors in Spring of 2007 while finishing my BA in Drama. The collaboration between GeriActors and UofA students was still a new thing, and I started by acting in plays they were prepping for a tour. I had no idea what I was getting into! But I was eager to experience first-hand what “seniors’ theatre” was all about. Instantly I loved it! The people, their stories, performing – all of it. A few short months after joining, I remember leading warm-ups and helping GeriActors set-up a performance for staff at the University of Alberta Hospital. As I watched them perform Am I Invisible? something clicked – I was seeing in-action the many ways theatre could help enrich older people’s lives: as a means to share stories and give voice to relevant issues, to express and encourage creativity and build skills, and to foster a sense of community and belonging. By the end of the performance I thought I want to be a part of this. I’ve been fortunate to work with GeriActors, both administratively and artistically, since 2007. I’ve learned a lot – about theatre, aging, community art, myself, others – laughed a ton, been constantly inspired and surprised, made lasting friendships with people of many ages, and have gotten to be a part of many wonderful performances, workshops and festivals. Graduate studies in the U.K. I recently finished my masters in Applied Theatre at the University of Manchester. The year-long program was challenging, expanded my theoretical knowledge, and gave me insight into the creative processes used by other community-based theatre groups around the world. My experience with GeriActors influenced all aspects of my studies. In a work placement, I drew upon interview and playwriting skills I learned with G&F to create and perform a play about a historic area in East Manchester. My dissertation examined the play-development process, with particular focus on the considerations that come to bear in community-based theatre when shaping personal stories into first-draft plays. My research and practice was based upon GeriActors play-development and a story graciously shared by one of our members. Directing Tjalling Zonderland and Something from Nothing. The Story of Tjalling Zonderland has been in the G&F repertoire for a few years. I remember the writing exercise that prompted Melle, a former GeriActor, to share the story and have seen its ongoing development into a full-fledged play. The play’s message can appeal to all generations: unexpected turns in life that seem awful somehow end up being the best thing ever. The exciting part of directing Tjalling is looking for the extra little details that will enrich every scene, whether it be giving a certain character in the play more prominence, enhancing the setting of a scene, or adjusting the blocking or the pace of the action. Something From Nothing is a newer piece we’re working on. It’s a traditional Jewish folktale about a grandfather who loves his grandson dearly, and weaves magic into garments, transforming worn-out clothes into new ones his grandson can wear. So far we’re having fun re-creating “magic” through physicality – actors become the implements like needle, thread, and scissors. As we get further into the creative process, we’re continuing to uncover why we’re drawn to the story, and what it really means to us, and finding ways to communicate those meanings through the play. I see the continuation of all the activities that have become key components of the organization: performances, workshops, FEST (Festival of Edmonton Seniors Theatre), collaborations with high schools, multicultural groups, research projects. I also hope that G&F continue to be recognized as a go-to anecdotal example of the many benefits of creative aging and intergenerational collaboration. For the actors, I see the GeriActors wherever they see themselves! They ultimately decide and shape their future by the stories they tell and the way they tell them. I hope they continue to express themselves, enjoy the rich community they’ve created, try new things, and above all, have fun. 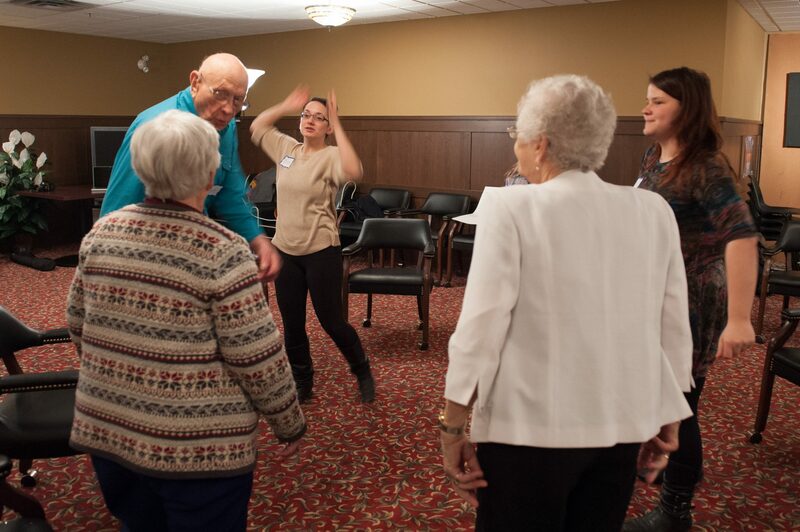 Intergenerational art / theatre is a way for people to connect across the generations, and deepen our understanding of ourselves, and others. Something magical happens when young and old create together: it’s hard to capture in words but the energy of youth and the wisdom of age combine to make a complete picture, something that everyone can relate to on some level. I love GeriActors and intergenerational art because it honours older people: their ideas, their concerns, their artistic abilities, their pasts and their presents. I believe their art, both the process of creating it and the product, have the power to shift many people’s ideas about aging, from those of deterioration and decline to ones of continued growth, expansion, expression, ability, mastery, relevance, and fulfillment. That’s what I saw watching the GeriActors perform all those years ago and I hope to see it for many years to come.